Old fashioned effervescent soda recipes were often used in homes and in small village pharmacies that could not afford the luxury of a marble soda fountain to manufacture soda water. Get ready for some fun. You're about to try some of the earliest soda fountain recipes ever published. Effervescent sodas were popular thirst quenchers for young and old alike. It's quite a thrill to taste the actual drinks that were once sold in pharmacies back in the early 1800s. These fizzy soft drink recipes are very easy to make, and although they might seem unusual at first glance, you'll be pleasantly surprised at how refreshing they actually taste. What IS an Effervescent Soda? The effervescent soda recipes used for making "soda drinks" all call for common household baking soda — bicarbonate of soda — to create an instant effervescence or fizz. The fizzy beverage does not stay bubbly in the glass for very long, so you must drink it immediately, within seconds after mixing. When the customer ordered a soda, the druggist would add several tablespoonfuls of "soda syrup" to a glass of ice-cold water — soda syrups are acidic and tend to be more watery than the regular fountain syrups. He would then stir in a very small amount of baking soda, just enough to make the beverage foamy. Effervescent sodas are surprisingly delicious and as there is no fermentation, there's no taste of yeast nor is there any possibility of alcoholic content. While the thought of putting household baking soda in a beverage may seem a bit odd or downright weird, I believe you will be pleasantly surprised with the results. Enjoy experimenting with the old time effervescent soda recipes. Maybe you'll acquire a taste for them as I have. It's a unique taste, but it's also a very refreshing taste that you'll grow to love. Whenever the old time effervescent soda recipes call for "soda," simply add a pinch of ordinary household baking soda (sodium bicarbonate) to taste per serving, and they will turn out just fine. Fountain operators sometimes stirred a tiny amount of fine, white flour into the syrup mixture as it helps to retain the bubbles and prolong the carbonation. Remember, always drink your effervescent soda immediately after mixing while effervescence is at its peak. Just mix it and drink it. Simple. Recipe quantities may be reduced to make smaller amounts. Don't worry about being too exact when measuring. Mix to your taste. Bottle any unused fountain syrup mixture immediately for use later, and refrigerate to prevent spoilage, as it will not keep long, just a day or two. The old time pharmacists used to make their soda syrups daily in hot weather. I sometimes enjoy mixing 1 to 3 teaspoonfuls of sugar, 1/2 teaspoonful of white flour, and 1/4 teaspoonful of baking soda in a glass of ice-cold water until it's completely dissolved; if you're wondering, the flour holds the bubbles longer. Then I stir in one to two teaspoonfuls of lemon, lime, or orange juice, and I drink it while it's still frothing. Adjust the quantity of sugar and-or juice to your own taste. Try it: It's really quite refreshing and the texture is velvety smooth. Take three pounds of granulated sugar and one and one-half ounces of tartaric acid, both dissolved in one quart of hot water. When cold add the well-beaten whites of three eggs, stirring well. Bottle for use. Put two large spoonfuls of this syrup in a glass of ice water, and stir in it one fourth of a teaspoonful of bicarbonate of soda. Any flavor can be put in this syrup. An excellent summer drink. Imagine, this fizzy soda beverage was once enjoyed by the President of The United States! Coffee sugar, four pounds; three pints of water; three nutmegs, grated; the whites of ten eggs, well beaten; gum Arabic, one ounce; twenty drops of oil of lemon, or extract equal to that amount. By using oils or other fruits, you can make as many flavors from this as you desire. Mix all and place over a gentle fire, and stir well about thirty minutes; remove from the fire and strain, and divide into two parts; into one half put eight ounces of bicarbonate of soda, into the other half put six ounces of tartaric acid. Shake each half well, and when cold they are ready for use by pouring three or four spoonfuls from both parts into separate glasses, each one-third full of cold water. Stir each and pour together and you have a nice glass of cream soda, which you can drink at your leisure, as the gum and eggs hold the gas. 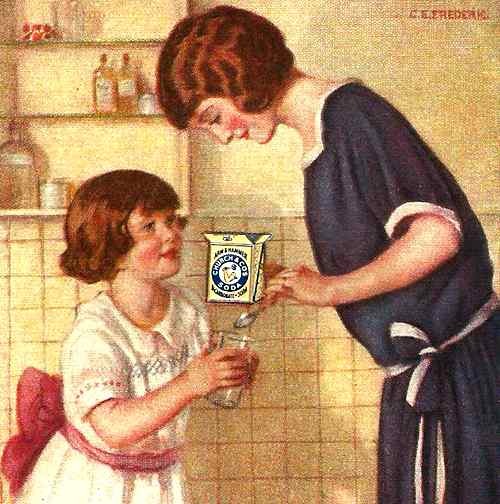 Two ounces tartaric acid, 2 ounces cream of tartar, 2-1/2 pounds white sugar, 1 quart water, whites of 4 eggs well beaten, 2 tablespoonfuls fine wheat flour; put all in a tin dish and heat, but not to boiling point; add 2 drops fine oil of lemon or other flavoring if preferred, and that will complete the syrup; when ready to use, pour 3 tablespoonfuls of the syrup into a tumbler 2/3 full of water, add as much baking soda as can be held on a dime and drink immediately after stirring. A cool, refreshing summer drink. Loaf sugar 10 lb, water 3 gills, mix, and warm gradually, so as not to burn; good rich cream 2 quarts, extract vanilla 1-1/2 oz, extract nutmeg 1/4 oz, and tartaric acid 4 oz; just bring to a boiling heat; for if you cook it any length of time it will crystallize. Use 4 or 5 spoonfuls of this syrup instead of 3, as in other syrups; put 1/3 teaspoonful of baking soda to a glass, if used without fountain. For charged fountains, no acid is used. Sugar, 2-1/4 pounds; citric acid, 2 ounces; juice of 1 lemon; water, 3 pints. Directions: Dissolve by heat, and boil 5 minutes; when cold add the beaten whites of 3 eggs, beaten into a small cup of flour; and then stir in the extract of lemon, or the extract of any other flavor you desire; bottle and keep cool; put 2 tablespoonfuls more or less as you prefer into a tumbler, of cold water, and stir in 1/3 to 1/2 teaspoonful of baking soda, and drink at your leisure, as the eggs and flavor hold a frothy cream on top. 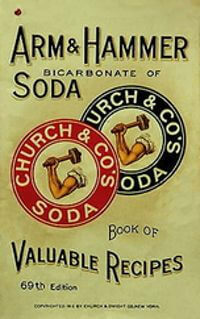 Because of their sodium content, the old fashioned effervescent soda beverages should be drunk in moderation. If you're on a salt-restricted diet or have to monitor your sodium intake, or if you are at all unsure, please do not consume beverages containing bicarbonate of soda without first consulting your physician or other qualified health provider. And to be safe, always use "pasteurized egg products" when the effervescent soda recipes call for the use of raw eggs.